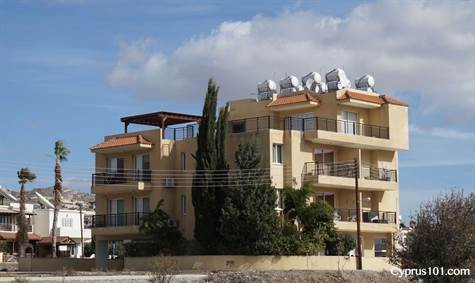 Yeroskipou Penthouse, Paphos District – This 2 bedroom, 2 bathroom penthouse apartment is located in the traditional village of Yeroskipou within easy walking distance to the village square. Paphos Town and the coast are a 5 minute drive away. The property has a stunning 71 sqm roof terrace with both mountain and coastal views. A pergola provides a wonderful shaded area and there is a wealth of space for seating, sun beds and outdoor dining. The accommodation includes an open plan living area with cosy lounge, dining area and inset kitchen, master bedroom with en-suite shower room, second double bedroom and separate family size bathroom. Sliding patio windows on two sides of the living area provide lots of light and easy access to the outdoor terrace. The kitchen is well equipped with fridge/freezer, washing machine, built-in oven, electric hob and extractor fan. In summary, this property is ideal for those looking for apartment living with lots of outdoor space in a convenient location. The furniture is included and there are full title deeds. Yes, it sold a long time ago.